Figure 14-8.Position for standing chest thrust. REVIEW 2 QUESTIONS Q1. What is the first-aid treatment for respiratory failure? Q2. When should artificial ventilation be administered? Q3. List the three types of artificial ventilation. a. b. c. Q4. What is cardiac arrest? Q5. 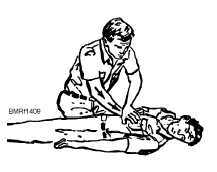 To be effective, CPR must be started within how many minutes of the onset of cardiac arrest? Q6. When you use the one-rescuer technique of CPR, what is the ratio of compressions to ventilations? Q7. When you use the two-rescuer technique of CPR, what is the ratio of compressions to ventilations? Q8. List the symptoms of airway blockage. a. b. c. Q9. 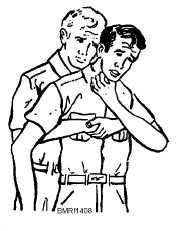 List the four methods you can use to clear a persons airway. a. b. c. d. 14-8 Student Notes: Figure 14-8.Position for standing chest thrust. Figure 14-9.Position for reclining chest thrust.